There comes a time, faced with the almost unlimited bounty of great Japanese food, that you want Spaghetti Carbonara — or rather my family (specifically my son) demands it. 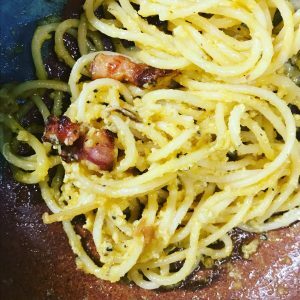 The myth of Carbonara is that it was created in post WW2 Italy, when some hungry GIs with a bunch of bacon handed it over to a local woman and said: Please make something delicious. The result was a genius moment of gastronomic ingenuity, improvisation and cross-cultural guess-work: Americans love bacon and eggs…sooo…let’s use that, toss in a bunch of parmesan and parsley and stretch the whole thing out to feed a bunch of folks by serving it with pasta! When my mother used to make Carbonara, the smell of bacon would draw me to the kitchen. I would to try to filch some pieces before dinner was served. I would watch in amazement at the alchemy of raw egg and cheese producing this smoky, creamy, savory treat. It was one of the first pastas I learned to cook on my own and I have spent years reaching for perfection — stealing bits and pieces from other Carbonaras that made an impression on me. Well, as I have nearly hit the mid-century mark, I have achieved what I think is the perfect Carbonara rendition and I feel I should share it. Three terrible things can happen to a Carbonara: Soggy Bacon Carbonara. Ultra-Greasy Carbonara. And finally, the Scrambled Egg Carbonara. I have devised a certain methodology to avoid these mishaps, so join me in the quest for the ultimate! Start with about 3/4 of a pound of good nitrate free bacon or pancetta or Guanciale. Chop into one inch pieces. Fry until crispy, remove with a slotted spoon and let drain on a paper towel. If you used super-fatty bacon, scoop out about half of the grease — typically good pancetta or Guanciale won’t release that much fat, so you don’t have to worry about this. Then cut 2 large cloves of garlic into thin slices. Add olive oil to the bacon pan and carefully saute the garlic until nicely tanned and crisp (DO NOT BURN!). Remove and let drain on a paper towel. The purpose of this step is two-fold: first you are flavoring your oil with garlic and secondly you will be adding these wonderful garlic chips as a finishing step. Now! Deglaze the entire pan with white wine (or sake, which I have found works surprisingly well) and really let all the alcohol bubble away. Finish with a knob of butter incorporated into your remaining liquid. Turn off heat. Prepare pasta. I don’t think I need to tell you how to make your pasta, but just remember to salt the water and keep a sharp eye out and taste for doneness (we are looking for a point just before al dente). Blend two eggs with about a cup of freshly grated parmesan. Add a goodly amount of freshly ground black pepper, a few pinches of salt and if you are me, a few generous shakes of Goya Adobo powder (NOT the one with cumin). Chop up a hefty amount of Italian Parsley. Now here is where timing and finesse becomes essential. When your pasta is at that perfect point, a touch before al dente, remove it and add it to your pan with a ladleful of your pasta water. Turn heat up to high and STIR your pasta, allowing it to drink up liquid. If your pasta seems too dry, add some more pasta water — those starches are helping to coast your pasta! When the majority of the liquid has bubbled away and your notice a certain creaminess to your pasta, turn the heat off. Wait a beat or two and then slowly add your egg / parmesan mix — This is a dangerous point because you do not want your eggs to scramble, so add the mixture s-l-o-w-l-y and keep stirring. When you are finished with that, add your crispy bacon, garlic chips and parsley. Toss everything together, gild with a touch of nice olive oil and serve. The result (hopefully!) will echo the comforts of morning with crispy bacon, egg and cheese while edging into the satisfaction of dinner with perfectly cooked pasta, garlic and the subtle bite and fragrance of parsley. Chomping down on a second or third helping my son opined, “Poverty food is the best.” He is right, Carbonara comes from lack of proper proteins, from desperation, from having to stretch out meager supplies and make the best of it — .Its super easy to cook a high quality steak, not so easy to make something delicious out of scraps. So, that’s it…A little lesson in Carbonara from a Jew living in Japan cooking some Italian food. Enjoy!